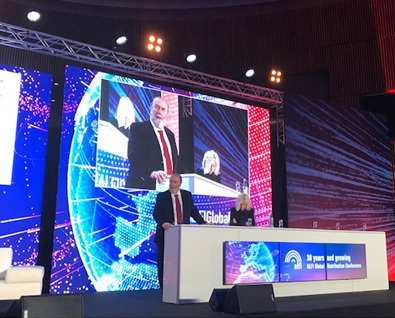 FIAP > News > FIAP’S President spoke in Luxembourg on the importance of investment in alternative assets for the pension funds. FIAP’S President spoke in Luxembourg on the importance of investment in alternative assets for the pension funds. Last September 25, FIAP’s President, Guillermo Arthur, attended the 27th Global Distribution Conference of the Association of the Luxembourg Fund Industry (ALFI). This Conference is designed as a unique platform for allowing participants from all over the world to share knowledge and exchange experiences on major trends and opportunities in worldwide fund distribution. On the occasion, ALFI Invited Guillermo to speak in the panel “Focus on Latin America,” referring mainly to the importance of investment in alternative assets for the pension funds, and in particular to Chile’s experience with the recent adoption of the law which authorizes the Pension Fund Managers (AFPs) to invest in new alternative instruments and expand their scope of investment. He explained that among the reasons for investing in alternative assets are: (i) it improves diversification, because it shifts the efficiency frontier of investments and allows the funds to access better risk/return combinations; (ii) it improves returns, allowing access to the “liquidity awards” offered by this type of investment; (iii) it allows long term investments, for example, in real estate and infrastructure assets, which have investment horizons similar to those of the pension funds. Given this empirical evidence, the Productivity Law, which allowed the pension funds to invest in alternative assets, was enacted in Chile in November, 2016. FIAP’s President also pointed out that the total investment of the pension funds in alternative assets was USD 5,512 million to June 2018, equivalent to 2.7% of the pension funds. This investment is channeled through domestic investment funds and has remained stable over the past three years. With the changes introduced by the new law, the pension funds can invest a maximum of USD 13,305 million in alternative assets, i.e., 6.6% of the total funds, said Arthur. Finally, in his speech, FIAP’s President briefly described how investment in alternative assets works in Mexico, Colombia and Peru.